Definition at line 43 of file util-pool.h. Definition at line 60 of file util-pool.h. Referenced by PoolGet(), PoolInit(), and PoolPrintSaturation(). Definition at line 51 of file util-pool.h. 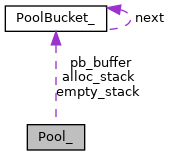 Referenced by PoolFree(), PoolGet(), PoolInit(), PoolPrintSaturation(), and PoolReturn(). Definition at line 49 of file util-pool.h. Referenced by PoolGet(), PoolInit(), PoolPrint(), PoolPrintSaturation(), and PoolReturn(). Definition at line 46 of file util-pool.h. Referenced by PoolGet(), PoolInit(), PoolPrintSaturation(), and PoolReturn(). Definition at line 63 of file util-pool.h. Definition at line 57 of file util-pool.h. Definition at line 56 of file util-pool.h. Definition at line 66 of file util-pool.h. Referenced by PoolGet(), and PoolInit(). Definition at line 53 of file util-pool.h. Definition at line 54 of file util-pool.h. Definition at line 64 of file util-pool.h. Definition at line 61 of file util-pool.h. Definition at line 62 of file util-pool.h. Definition at line 44 of file util-pool.h. Definition at line 67 of file util-pool.h. Referenced by PoolGet(), PoolPrintSaturation(), and PoolReturn(). Definition at line 58 of file util-pool.h. Definition at line 45 of file util-pool.h.